Ordinarily I would support the National Consumer Agency and their plight to protect the Irish consumer. But there's one case recently that has me screaming NANNY STATE as I shake my head intending to defy the new ruling. This is the effective ban on amber teething necklaces aimed at babies. From a parents' point of view, we will adopt anything that reduces our children's pain and calms them down. Parenting is a tough job, so any small help when they're sick is very welcome. Because they do get sick when they're teething. It reduces their immune systems, it blocks up their noses and makes them cough, it gives them ear infections and fevers, and it makes them very cranky. Amber is a natural anti-inflammatory which reduces the swelling and pain around the ear, nose and throat area when teeth break through the gums into the mouth. I've used it for all 3 of my kids - with impressive results. It does work - they have less problems cutting teeth and it reduces the sleepless nights and the amount of Calpol/Nurofen you have to administer to relieve their pain. My youngest, who is 23 months, is still wearing his now. He never seems to get teething pains (something I put down to the necklace). That's not just my opinion, thousands of other mums swear by them. One mum I asked about this, said: "I'm not worried about the ruling and I'm not taking my son's off. If I take it off the cheeks go red, the drool starts and he's crankier than usual. I honestly thought it was a crock but got one as a gift and put it on him because I thought it was cute, made him look like a little surfer dude! "It was only a week or two later when I took it off to wash it I realised within an hour all the symptoms of teething showed up - red cheeks, runny nose, drool - when I put it back on they stopped again, so I was sold! The good ones have safety features built in and to be honest he's swallowed much worse than a minuscule amber bead - I do baby led weaning so he's always gagging, little beads are the last of my worries!" In my own house, little Lego is everywhere - heads of legomen the same size as the amber beads are all over the floor discarded by my 5 year old. The youngest bites them off too - and guess what, he's never choked on one. He spits them out. If we're banning amber beads, why not ban grapes? They are far more dangerous in choking terms because their size can block the windpipe - there has been incidents where grapes have killed toddlers who have swallowed them whole. Grapes or cherry tomatos are the size we need to be worried about, not tiny nuggets of amber that would just get swallowed whole if the unthinkable happened and the necklace broke. Which brings me to the inbuilt safety feature of these necklaces - they don't break off: they are so tightly woven and with an extra safety stitch after each bead that they don't naturally break away from the necklace. And in safety tests, when smashed with force they just crumble into dust. It's quite ironic really that the NCA's own research into amber teeting necklaces revealed that no instances of choking were found. It is simply the fear of the unknown that is driving this decision. Because they need to give it a label, they reclassified the teething aid as a ‘toy’ - which means that because it contains 'small parts' it is not suitable for children under 36 months. But who would put a teething necklace on a 3 year old? It is effectively putting a whole segment of the market out of business. One online retailer Teething SOS weighed up its business options and decided safety was paramount over staying in business, so quickly issued a recall. Its entire business model is based on selling amber as a teething aid to babies so will this drastic move put it out of business? EarthMother.ie was a bit more savvy, simply putting a disclaimer on the product: "According to EU Toy safety regulations EN-71-1 necklaces are not suitable to use as toys for children under 36 months. Our necklaces are not toys, please do not allow your children to play with or chew on them. Our children's jewellery must be worn under adult supervision. Under a European wide investigation into amber teething products some jurisdictions have changed the labeling requirements to "use over 36 months only". This is because of it's composition of small parts and is not because of any question over the amber itself." Since talking to mums about this issue, my feeling is that these necklaces totally polarise parents to the point that they either love them or hate them. There'll always be Fearful mums who never let little Jonny out of their sight and would never put something so crazy like a necklace on him. The opposite are the Alternative mums who never even give their kids Calpol when they're sick. I'm somewhere in the middle - but I will be joining in the backlash against the NCA and the European directive and staying true to what's already worked for us. Lorcan still wears his teething necklace today and I've zero fears about it as a choking hazard. Personally I think the NCA is scaremongering distressed mums by this new ruling, demonising something they've already been using problem-free for years. Thankfully, not every one is listening - they're using common sense and staying with their instincts. 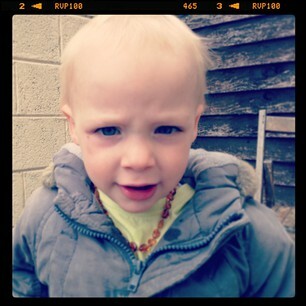 Grannies already like to tut tut when they see my 23 month old boy wearing his necklace - what will they say now?